The Plan B has been DISCONTINUED, but don’t worry! More than 4 years ago we began work on the Plan B and quickly realized that machined aluminum was not the best medium for our product. Since then we have been modeling and prototyping to move our product to polymer and we have finally made the move. The MagFIX for the S&W M&P Shield in 9mm and 40 is now shipping! Where can I find out more about the MagFIX? Plan to NEVER need it. Know it will work when you do! Improve the performance of your Smith & Wesson M&P Shield extended magazine with the Plan B and its interlocking base pad and sleeve. The Plan B will keep the sleeve where it belongs, help your empty magazine drop free giving you smoother and faster reloads. In addition, the Plan B makes dealing with malfunctions easier than the factory parts even if you only have one hand to work with. The Plan B is currently in redevelopment as we are transitioning the product from aluminum to an injection molded polymer. Two versions of the Plan B have been shipped to initial customers in three batches with an outstanding reception. In order to bring the per part price down to a level that will bring the Plan B to every Smith & Wesson M&P Shield owner it was necessary to make the move to polymer. Currently the engineering work is being completed and prototypes made to make sure that our mold will yield exactly the part you need to improve the performance of your Shield’s magazines and make your reloads more consistent. Send me information on the Plan B now. The Plan B for the S&W Shield The Plan B keeps the magazine extension sleeve where it belongs. This means faster and less problematic reloads and less chance of pinched skin on the heel of the hand. The result: better reloads and an increase in your confidence in your Shield. The Plan B reduces the chance of the extended magazine being trapped in the gun by your hand when reloading. The result: better reloads and an increase in your confidence in your Shield. The Plan B provides a more secure grip for stripping a stuck magazine out of a malfunctioning gun. The result: better malfunction clearing and an increase in your confidence in your M&P Shield. Once the Plan B is redesigned and the mold is completed it will again be for sale! Polymer Plan B’s will be available soon! We expect that the Plan B will be available for purchase in mid-June of 2017. The first run will be 2000 parts. Some of those parts will be for testing and evaluation to make sure the redesign is exactly what we are looking for. This means less than 2000 Plan B magazine base pads for the S&W Shield will be available for purchase. Make sure you are notified of developments when the Plan B is available. A reliable modern striker fired handgun chambered in 9mm and .40 S&W in an carry-able and shoot-able package. When it comes to concealed carry, there are few handguns as popular as the Smith & Wesson M&P Shield. The Shield seems to sit in a sweet spot that consumers love. The Shield is small and light enough that it is relatively easy to carry and conceal, but it is large enough that it is relatively easy to shoot. Let’s take a look at the Shield, its strong points and its weaknesses so that we can better understand the Smith & Wesson M&P Shield as a concealed carry handgun. The Smith & Wesson M&P Shield is a compact frame, single stack, striker fire action handgun. It is available chambered in both 9mm and .40 S&W. The Shield fits the bill for many folks when it comes to a concealed carry handgun. With a capacity of 7 or 8 rounds in 9mm and 6 or 7 rounds in .40 S&W, the Shield has a higher capacity than typical concealed carry revolvers. It also is easier to reload because it is magazine fed. The Shield has a more reasonable trigger than most guns its size making this gun a great option for those that want a quality semi-auto for concealed carry. The Shield is available both with and without a manual thumb safety and all models are equipped with a trigger safety and other internal safeties. Like all the M&P Series pistols, the Shield has a polymer frame and a black coated stainless steel slide. Models are available with regular three dot sights as well as three dot tritium night sights. If you are looking for a slim, compact, easy to shoot semi-automatic, the Smith & Wesson Shield should be on your short list. Plan B v3.0 will be injection molded from durable polymer for lightweight, consistent performance and reduced cost. The Plan B is designed from the ground up to solve problems that I saw repeatedly with students out on the range. One of the important characteristics of a quality concealed carry handgun is reliability. When it comes to reliability, the Smith & Wesson M&P Shield hangs in there with the best of them. Until it comes to that pesky extended magazine. The extended magazine has a polymer sleeve and base pad that look like well designed parts. That however, is far from the truth. The reality is that all the real problems that the Shield has stem from this little plastic part. The sleeve floats around and gets in the way. The sleeve traps the empty magazine in the gun. The sleeve makes it hard to deal with malfunctions especially when you only have one hand to work with. All these things can be easily dealt with to improve the performance and the reliability of the Shield and that is exactly what we have done with the Plan B. The Plan B fits on the extended magazine of the M&P Shield and works with both 9mm and .40 S&W models. The patent pending tongue and groove design locks the sleeve firmly against the base pad making sure the sleeve is right where it is supposed to be when you need to reload your handgun. We have removed material from the back of the sleeve to help increase the likelihood that your magazine will drop free when it is supposed to. The Plan B is machined from a solid block of aluminum and hard anodized. The Plan B is durable and good looking. The Plan B features a slightly oversized base pad that gives your fingers something to grab on to when you need to even if your hands are wet, cold, covered in blood or simply not working as well as you would like. The oversized base pad is accentuated in the front to help you deal with malfunctions efficiently even if you only have one hand to work with. The sleeve on the extended magazine slides on the magazine tube. Tell me more! Send me information on the Plan B now. The Plan B for the S&W M&P Shield was designed to deal with a specific set of problems that arise from the sleeve on the extended magazine for both he 9mm and .40 S&W Shield. The first problem that becomes apparent to people is that the sleeve on the extended magazine is intended to be held in place by friction alone. When it comes to casual range use, the part works just fine, however, the Shield isn’t intended to be used as a range gun. Instead, the M&P Shield is a concealed carry handgun. That means it needs to perform like a concealed carry handgun. When the extended magazine is carried as a spare magazine as intended, the friction of the sleeve proves to be inadequate in keeping the sleeve where it belongs. This could be a problem and the sleeve could slide out of place during carry in a pocket or in a magazine pouch. The sleeve could interfere with a smooth reload. The sleeve could make gripping the magazine consistently during the reload difficult. The out of place sleeve provides two possible points where the flesh of the hand can be pinched while reloading. This alleviates the issue of sleeve movement while the magazine is being carried inverted in a vertical magazine pouch, which is a common issue with the OEM magazine’s sleeve. Keeping the magazine extension sleeve where it belongs, in place, ensures a faster and less problematic reload and with no pinched skin on the heel of the hand when reloading the handgun. 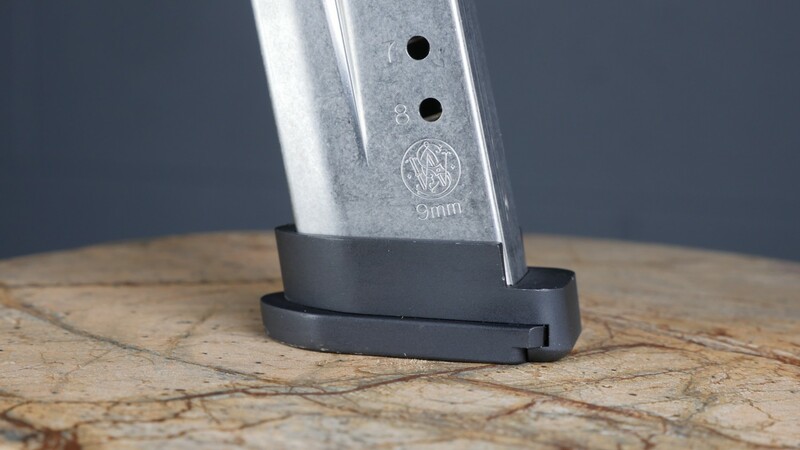 The design of the Plan B for the S&W Shield utilizes a unique tongue and groove system that mates the base pad and the magazine extension sleeve. This tongue and groove system makes it impossible for the magazine extension sleeve just slide up on the magazine. By eliminating the ability of the sleeve on the Shield’s extended magazine to move we have eliminated the the issues that come along with sleeve movement while the magazine is being carried inverted in a vertical magazine pouch or in a pocket. Because the Plan B keeps the magazine extension sleeve where it belongs, in place, ensures a faster and less problematic reload and with a reduced chance of pinched skin on the heel of the hand when reloading the handgun. Most importantly, you have an increased confidence in the defensive handgun you trust your life to! The sleeve on the extended magazine traps the empty magazine in the gun when you need to reload. The Shield’s extended magazine sleeve or spacer doesn’t just cause problems when it is in your pocket. It can also be an issue when it is already in your gun. When that extended magazine is empty and you need to reload your Shield, the profile of the rear of the sleeve becomes an issue. The heel of most shooter’s hands tends to press against the sleeve as if it is an extension of the grip. This will trap the magazine inside the gun and prevent it from dropping free and requires you to either use two hands to strip the magazine from the handgun or release your grip on the gun so that the heel of the hand no longer contacts the sleeve. Both of these adjustments have problems. If you release the magazine with your primary hand and strip the magazine away with your secondary hand, the amount of time it takes you to reload your gun increases. If you are in the middle of a violent encounter with an empty gun you want to get that gun reloaded as quickly as possible. Opening the hand up to drop the magazine free causes its own problems. Keep in mind that humans have survived as a species because we make and use tools. In violence, those tools only help us if we hold on to them. This means that over generations humans have developed a tendency to grip our tools very tightly under stress. The lesson here is that although you may want to open up your hand to drop the magazine free, your natural tendency is to hold on to the gun with a crush grip. Why? Simple, so you don’t drop the life saving tool you are depending on. If we follow the logic of human survival it tells us that we DON’T want to open our grip to drop the magazine free. Instead we need a solution to the problem that is going to work well with our natural tendencies. The Plan B magazine extension sleeve and base pad reduce the chance of the extended magazine being trapped in the gun by your hand through removing excess material from the back of the magazine sleeve. This reduces the interaction with the heel of the hand and as a result your magazines drop free much more easily. The sleeve and base pad on the extended magazine are contoured and smooth making it difficult to strip out a stuck magazine. The factory magazine sleeve and base pad are contoured to match the grip of the M&P Shield pistol. the design looks elegant, but the looks of a concealed carry handgun aren’t as important as the way it functions. With the S&W Shield, the looks get in the way of reliable performance especially under the worst conditions. When a magazine is stuck in the gun due to a malfunction, the flush edges of the factory parts give no purchase for the shooter to forcibly remove the magazine by pulling at the base especially if you are forced to deal with the malfunction with only one hand. The Plan B features an oversized base pad with Emergency Manipulation Lips extending to the front and on both sides of the base pad. This additional material allows additional a solid purchase for the fingertips in cold or wet conditions and allows a stuck magazine to easily be stripped. In addition, these extensions can be used in conjunction with a belt, holster or other hard object to strip a stuck magazine if only one hand is available for manipulation. Certainly there is no handgun that is the perfect concealed carry handgun for every person in every situation. It would be unrealistic to expect one pistol to fit the needs of such wide variety of circumstances. The M&P Shield does a great job as a concealed carry handgun for those that need or want a modern striker fired handgun in a compact and slim single stack configuration. The Shield is easy to carry, easy to conceal and easy to shoot. Smith & Wesson has designed and produced a reliable handgun in general but the Shield does struggle a bit with reliability when it comes to the extended magazine. This is the specific reason we designed the Plan B. If you depend on a Sith & Wesson M&P Shield as your concealed carry handgun, you owe it to yourself to take a look at the Plan B and evaluate its role on the extended magazine of your S&W M&P Shield. The Plan B is Your M&P Shield Problem Solver! The Plan B increases the reliability of your Smith & Wesson Shield and extended magazine.